The family of regular languages of infinite words is structured into a hierarchy where each level is characterized by a class of deterministic ω-automata – the class of deterministic Büchi automata being the most prominent among them. 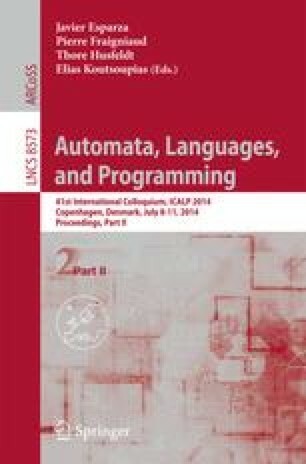 In this paper, we analyze the situation of regular languages of infinite Mazurkiewicz traces that model non-terminating, concurrent behaviors of distributed systems. Here, a corresponding classification is still missing. We introduce the model of “synchronization-aware asynchronous automata”, which allows us to initiate a classification of regular infinitary trace languages in a form that is in nice correspondence to the case of ω-regular word languages.